One of the many things I learned when I lived in London (while at cooking school) was that the British actually like fruit cake—or Christmas Cake as it is more commonly called there. This surprised me because my experience with fruit cake was not at all favorable. Like most Americans I thought of fruit cake as an annual joke...something one might give as a gag gift. Something else I learned in cooking school was that if I didn't like a food, it was probably because I had never had it prepared properly. When I discovered that Christmas cake was well-liked in England, I wanted to have the opportunity to taste a properly made cake so that I could find out if I liked it too. An Australian friend and fellow student shared her recipe with me along with detailed notes on how to prepare it and vary it to suit my available ingredients. The following fall, after I had returned home, I made her cake. My friend had told me that her recipe was a fairly typical one and over the years as I have looked at other recipes for Christmas cake, I have found this to be true. The fruit portion of a British Christmas cake is made up mostly of dried fruits (different kinds of raisins, figs, currants) along with a smaller portion of mixed candied peels and candied cherries. In my experience it was these candied fruits that made up most of the fruit portion of American-style fruit cakes—and the candied fruits used were almost always pretty awful. The candied fruits available in Europe and the British Isles are of a much higher quality. When I made her cake, I sought out imported candied fruits so that all of the ingredients in my cake would be as fine as possible. After making the cake, I dutifully fed it with brandy every week, looking forward to when I would be able to sample my project at Christmas. I think the fruit cake I made was probably pretty good—certainly better than any fruit cake I had ever had before. I remember that my Dad enjoyed it. But we never did eat all of it (it was a very big cake). Making it gave me an appreciation and respect for fruit cake that I hadn't had before. Today, if I were served a slice of good Christmas cake, I would eat it and enjoy it. But since I didn't grow up with it, it doesn't really seem like "cake" to me. Traditional fruit cakes appear to be mostly fruit (and nuts) with just enough cake to hold the fruit and nuts together. When I eat cake, I really want to eat cake. I love dried fruit, so the idea of a nice cake that contained lots of brandy-spiked dried fruit was very appealing to me. I was a bit disappointed to find that this really isn't what fruit cake, in its traditional form, is. A few years later I ran across a recipe for "Brandied Currant Tea Bread" in a little book called Tea Breads & Coffee Cakes by Elizabeth Alston. In her description of the recipe, she says "This is what a fruit cake should taste like but never does." Because Elizabeth Alston was raised in England I sat up and took notice. This little cake was excellent—mostly cake, studded with brandy-soaked currants. I particularly liked the fact that the cake was made with white sugar and without spices. This actually makes the cake considerably different from the dark, spice-laden Christmas cakes of Britain. For a while, this recipe was my "fruit cake". Several years back, Gourmet magazine published a recipe they called "Holiday Fruit-filled Pound Cake"—clearly a euphemism employed to trick fruit cake-wary Americans into trying it. In many ways it was similar to Ms. Alston's tea bread, but instead of using currants alone, it used a mixture of colorful dried fruits, including apricots, cranberries and golden raisins. This cake was good too. Interestingly enough though, it had too much fruit for me—even though it still had much less fruit than a traditional Christmas cake. I decided to combine the two recipes. My version uses the mixed fruits from the Gourmet recipe—reduced somewhat in quantity. I have also included some homemade candied orange peel in my cake. While reading up on fruit cakes, I discovered that the flavor profile of this adapted cake is actually quite similar to a traditional Scottish fruit cake called a Dundee Cake. Named after the Scottish city of Dundee, it is a light colored fruit cake that is flavored with almonds. Like its British counterparts though, in its traditional form it has a much greater quantity of fruit than I would find acceptable. When you make this Brandied Fruit & Almond Pound Cake (observe the use of the word "when"), you will notice that there is a total of 1 1/2 cups of dried fruit and candied peel in the recipe. If you prefer less fruit, I have successfully made the cake without the candied orange peel and with as little as 1 cup of dried fruit. If you like more fruit, I think that you could probably increase the total amount of fruit to 2 cups without altering the cake's pound cake-like character too much. Other dried fruits could be added or substituted for those I have used...dried tart cherries, dark raisins and chopped dried figs come to mind. As far as the actual process of mixing up the cake is concerned, make sure that you don't short cut the creaming process. The butter and sugar should be very fluffy before you begin to add the eggs. And the eggs must be at room temperature—refrigerator-cold eggs can cause the batter to break. Insufficient creaming and/or cold eggs will result in a cake that is damp and heavy (it will still taste good, but I don't think you will like the texture). If you forget to pull your eggs out ahead of time, set them in a bowl and cover them with hot tap water for 5 minutes or so. This cake should be served in elegant, thin slices rather than thick slabs. Those who want a larger portion (like me) can take a second slice. You should be able to get 12 to 16 slices to serve 8 to 12 people. 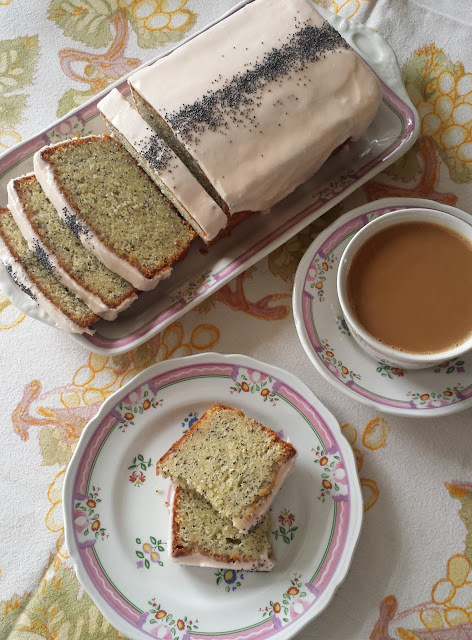 The cake is a wonderful afternoon treat with a cup of coffee or tea. Because there is more cake than fruit, it doesn't have the keeping qualities of a traditional fruit cake. Both Elizabeth Alston and Gourmet recommend that the cake be eaten within 5 days—although I think it probably lasts longer. How much longer though I really can't say since it never seems to last longer than a week in my house. Place the dried fruits in a bowl and add the brandy. Let sit at room temperature for at least an hour, stirring occasionally. The fruit may be macerated several days ahead. If doing ahead, cover and refrigerate. Butter an 8 cup (9x5x3-inch) loaf pan and then line the bottom and long sides with a piece of parchment paper, trimming the parchment level with the top of the pan. Butter and flour the parchment. Set aside. Toast the almonds in a 350° oven until lightly colored and fragrant. Cool to room temperature. Measure out 1/2 cup (2 oz.) and set aside. Grind the remaining 2 1/2 oz. of almonds until powder fine, using a rotary nut grinder or the food processor. If using the food processor, add several tablespoons of the sugar to absorb the oil from the nuts. In a medium bowl, whisk together the flour, baking powder, salt and almond flour. Set aside. In the bowl of a stand mixer, cream the butter with the sugar on high speed until very light and fluffy—about 5 minutes. After 3 minutes, beat in the zest and vanilla and continue to beat for another 2 minutes. Add the eggs one at a time, beating well after each addition and scraping down the sides of the bowl before adding the next one. Fold in half of the dry ingredients. Fold in the dried fruits along with the brandy. Fold in the remaining dry ingredients along with the diced orange peel and reserved nuts. Turn the batter into the prepared pan, smoothing the top. Transfer to a 325° oven and bake until golden brown and springy to the touch—about 1 hour and 15 minutes to 1 hour and 30 minutes. A tooth pick inserted in the center will come out free of crumbs. Cool in the pan for 10 minutes. Turn out onto a wire rack to cool completely before wrapping air tight. The cake may be enjoyed freshly made, or it may be kept—well-wrapped—at room temperature for five days. The cake tastes best if made a day ahead. The cake also freezes well. Note: If you don't have a nut grinder, you may substitute 2 oz. of blanched slivered almonds plus 2 1/2 oz. of purchased almond meal or almond flour for the total amount of almonds given in the recipe. Paige this looks just great, can't wait to try this and I'm off the week of Christmas so I'll include this in my baking. i made this last night, eliminating the cranberries and adding extra of the other three. i also increased the amount of chopped nuts adding in pecans and walnuts. i replaced the brandy from macerating the fruit with orange juice from the zested orange and swapped half the vanilla for almond extract with remarkable results. i suspect the original recipe closely resembles the fruitcake my french baking trained grandma used to make but i couldn't resist adapting it. its an amazing recipe to be able to withstand all my substitutions. and additions. thanks for sharing! I'm so glad you liked this cake. Your adaptations sound delicious! The orange juice is a great substitute for the brandy...and I have often thought about perhaps including some pecans in this cake. Thanks for taking the time to come back and comment!